We should encourage China towards democracy and human rights. China is, of course, a huge country with a huge proportion of the earth’s population and is growing fast, producing fast and consuming fast. … and we don’t really know what to do about it. There is a violence to China’s recent growth which has about it something of violent energy put into the Long March and the Cultural Revolutions of previous generations. China also has a large church with a very fresh and constructive life and some amazingly courageous and noble leaders. Disband its network of corrective labour camps the Laogai network of (in 2008) as estimated 1,400 camps or industrial facilities where the workers are prisoners who have not had the chance to defend themselves before a court but who are subject to “Administrative Detention”. Release political prisoners and democracy activist such as Liu Xiaobo who organised the collection of signatures on that petition to the authorities asking for the kind of civil and political rights which we in the west would consider obviously right. Non-refoulement. ie They should stop their horrible practice of sending refugees from the appaling state of North Korea back to the custody of their own government and their very possible execution on arrival for having dared to escape their own country. Bullying neighbours. They should accept that some Chinese citizens don’t want to be citizens of the People Republic but prefer to remain independent of mainland China in the state founded by Chiang Kai Shek in what we now call Taiwan. I would also like them to trade more gently on the world markets and to tolerate less than stratospheric rates of growth so as not to pillage the planet of its mineral and agricultural resources. Mind you we have to stop doing that too. It is just perahps that they are more efficient at doing it and have more money to spend at the moment. I think China’s central has been creating money with which to buy up US Treasury Bonds. This is legitimate in a sense since it goes with such intense productive activity but if it happens we should recognise that it does. The trade imbalance is a tough problem and one of the most important in today’s world and I need to get a good understanding of it. I am reading about banking in China. They will not want to because they will be afraid that impending contracts will go to others or their permission to trade with China will be stopped and they will lose out to competitors. However, two things, first: read about the Laogai prison factories and see if you are happy buying goods from a nation that does that with its citizens (even if the goods you buy may not themselves have come from a Laogai prison factory). Second, bear in mind that if you stick at it a point is likely to come when one of the major stores gives in and goes and makes an appointment with the Chinese Ambassador. Then we might get to a tipping point; it may snowball and the other stores may have the courage to do it too or not want to be seen to be lagging behind and losing customer share by doing so. if lots do then it could get the sort of message through to the Chinese leadership who I am pretty sure will notice. They will probably be very annoyed but it seems to me the right thing to do and it could change things a lot. If it helps energetic China come out onto the world scene as a conscientious member of the international community having imbibed the ethics of Western Christendom at its best then the world will be a happier place and we might start getting some useful decisions at the UN. 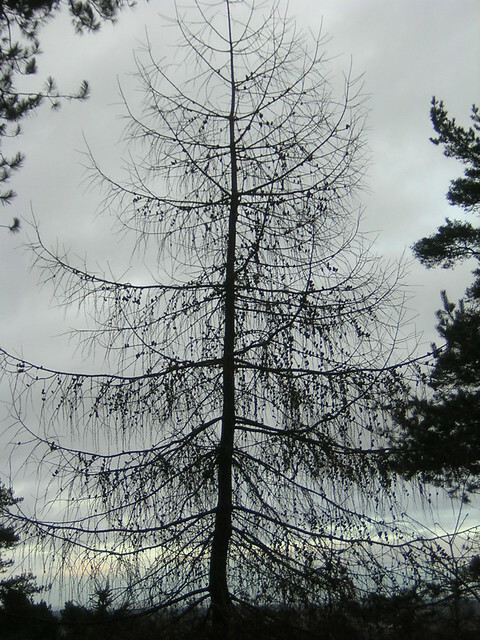 A pretty picture of a larch in the Lickey Hills near Birmingham!